Everyone loves a cocktail with a cool garnish. 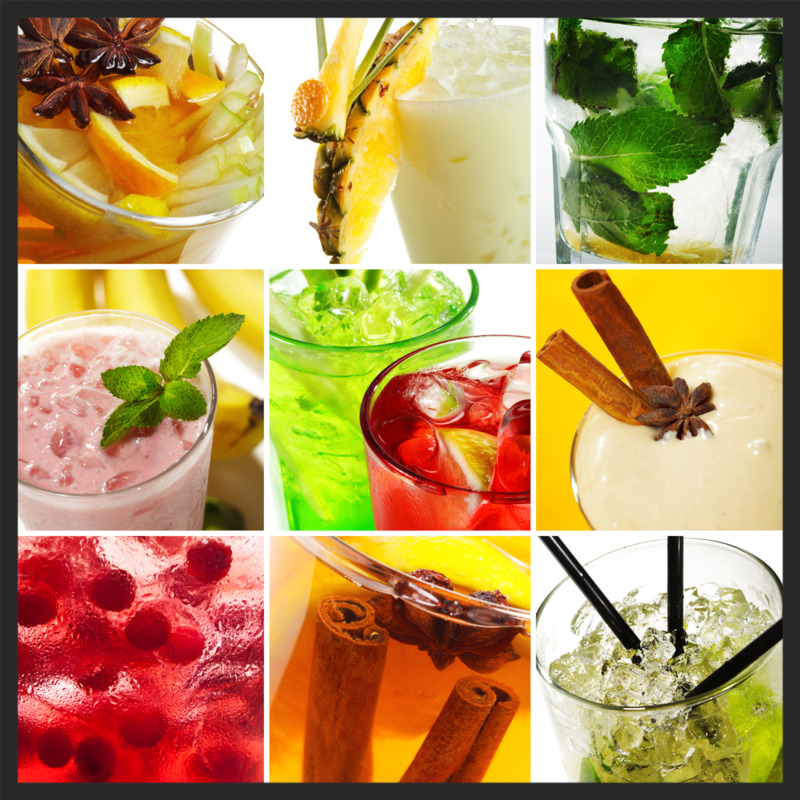 Not only does it draw your eye to the cocktail but also makes the cocktail look more appealing. Many times when ordering a cocktail at the bar I see beautiful and crazy garnished cocktails, which I immediately want to order. The extreme garnished cocktail has come a long way from your typical garnished Bloody Mary and tiki cocktails. Classic cocktails and unique bartenders creations are using extreme garnishes to offer customers a fun and creative cocktail experience. Extreme Bloody Mary garnishes include anything from sliders to chicken wings. The classic celery and olive garnish has been elevated to include crazy appetizer type garnishes. At Score on Davie in Vancouver they serve the Checkmate Caesar (A Canadian Version of a Bloody Mary). The garnishes for this cocktail are basically an entire meal for two with roasted chicken, Score burger, pulled pork sriracha glazed slider, onion rings, chicken wings, a pulled pork mac&cheese hotdog and a brownie for desert. Tiki garnishes are also typically garnished with crazy items including flaming citrus and specially carved fruit. Three Dots and A Dash in Chicago offers a wide range of crazy garnished tiki cocktails. Most of their cocktails are garnished with multiple items that include dry ice, various tropical flowers, and flaming citrus. A crazier option includes a cocktail that serves 6-8 people that is served in a treasure chest and garnished with dry ice and orchids. The Bazaar in Miami has created the Salt Air Margarita, which elevates the classic margarita. The garnish is salt air and is comprised of salt-water foam that looks like air. Customers get a more creative take on the classic garnished margarita with a salted rim. The Sugar Factory in NYC offers cocktails garnished with the ultimate childhood treats. From lollipops to cotton candy to gummi bears they have garnished cocktails with your favorite treats. The Lollipop Passion Goblet is a tropical drink comprised of melon, coconut, and pineapple with vodka, coconut rum, and melon liqueur. 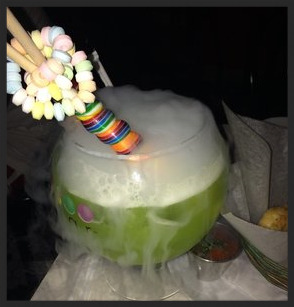 It is garnished with beautiful rainbow spiraled lollipops and candy necklaces. London has numerous upscale cocktail bars serving innovative cocktails with creative garnishes. Bassoon in the Corinthia Hotel has no shortage of marvelous cocktails with garnishes to match. The English Tea Punch with gin, Martini Bianco infused with lavender and fennel seeds, mint, elderflower cordial, and jasmine tea is garnished with abundant ingredients that correspond to the cocktail ingredients. The garnish includes lemon zest, dried lavender, dehydrated granny smith apple, mint, dehydrated pear, and fresh blackberries. The Nightjar in London is no stranger to the extreme cocktail garnishes scene. This theatrical bar has many cocktails that express a big personality beyond the liquid itself. The Toronto cocktail is made up of Woodford Reserve Bourbon, roasted pecan and maple syrup, Fernet Branca, and Nightjar bitters. The best part of this gem is the smoking blossom of orange cotton candy above the rim of the low ball glass. Lolo in San Francisco is serving a spin of the popular Moscow Mule made with mezcal instead of vodka. The mezcal mule has mezcal, tequila, pomegranate molasses, angostura, and ginger beer. The cool part of this drink is the extreme garnish of an ice bowl placed on top of the cocktail that holds pomegranate seeds and mint garnishes. Many bartenders are elevating their cocktail garnishes to enhance the guest experience. Guests also tend to remember cocktails that have more extreme cocktail garnishes. Have you seen any extreme cocktail garnishes lately?